Homeowner tips: Spring cleaning ideas | Nor-Cal Floor Design, Inc.
Clean your ceiling fixtures, including lights and fans. Clean your baseboards, cabinets, walls and wood work. 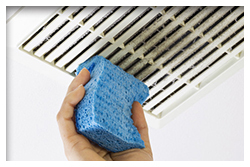 Check and/or replace your AC/furnace filter. And though not necessarily cleaning-related, this is also a good time to check/replace smoke alarm batteries.